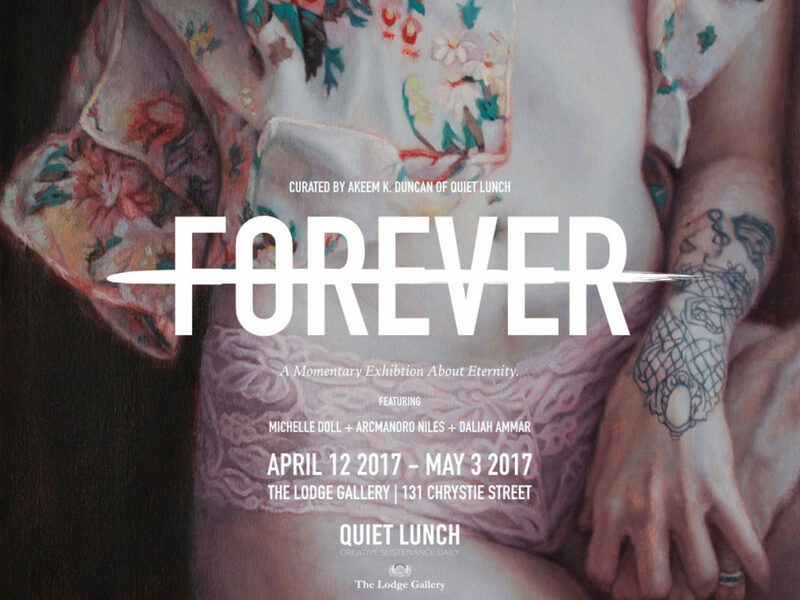 The Lodge Gallery is proud to present, FOREVER, a group exhibition focused on the fleeting eternity of human emotions and the resulting memories and experiences that seem to last longer than we do. A lover’s embrace or quarrel. the scent of a relative, a joke shared between friends… these moments are forever; contributing to the ongoing jouska within. Even when you “forget,” dormant memories and experiences seem to activate themselves on their own, almost instinctually and often without warning. Featuring pieces by Michelle Doll, Arcmanoro Niles, and Daliah Ammar, FOREVER requires each painter to dig down into the depths of their own emotions, as well as the emotions of others, and come up with something that can withstand the eroding sands of time. Curated by Akeem K. Duncan of QUIET LUNCH, FOREVER is a testament⏤not just to the concept of forever in general⏤but a delicate, innate forever that exists in a way that cannot be described through words alone. Nonetheless, through the visuals of Doll, Niles and, Ammar, we will quickly uncover that forever is now.